that captures all of the beloved character's high-octane energy. The one-of-a-kind concept vehicle will be unveiled on July 13, during Nickelodeon's SpongeBob Day at the Padres vs. Giants game in San Diego, Calif. The car will then hit the road for a 'Happy Driving!' promotional tour throughout the US, bringing SpongeBob's special brand of fun to seven locations across the country. "We are pumped and honored to partner with Nickelodeon, and especially SpongeBob, to help launch the all-new 2014 Highlander. 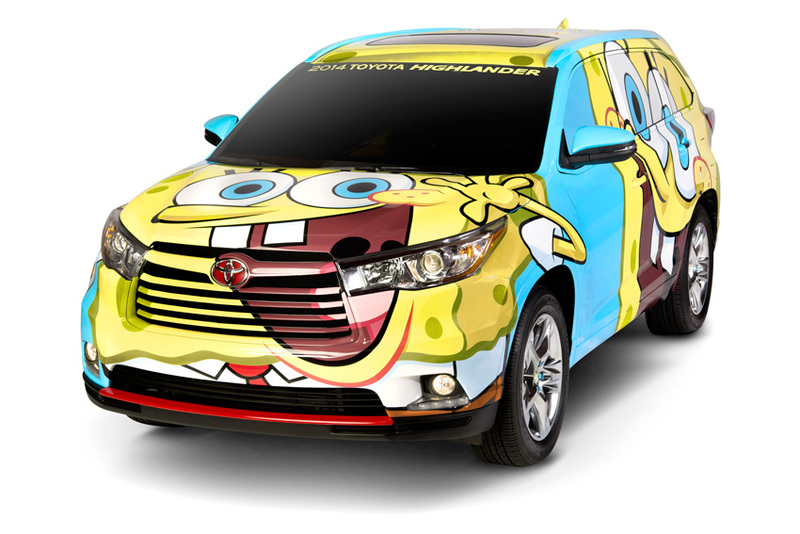 Like the Highlander, SpongeBob is family friendly and just plain fun - what more could you want in a family vehicle and cartoon?" said Jack Hollis, VP of Marketing, Toyota Motor Sales, U.S.A., Inc.
As part of the 'Happy Driving!' campaign, the SpongeBob Toyota Highlander will visit seven locations, including Nickelodeon Suites Resort, Orlando, Fla. (Aug. 2-4); SpongeBob Shellabration, Hollywood, Calif. (Sept. 7-8), Artscape Festival, Baltimore, Md. (July 19-21); Eat Real Festival, Oakland, Calif. (Sept. 27-29); Nickelodeon Universe at Mall of America, Minneapolis, Minn. (Aug. 9-11); NASCAR Sprint Cup Series at Chicagoland Speedway, Chicago, Ill. (Sept. 15); Gourmet on Gore Festival (Aug. 30-Sept. 2); LA Auto Show, Los Angeles Calif. (Nov. 30-Dec. 9). These events will feature character meet-and-greets and photo opportunities, a prize wheel where kids and families can win exclusive SpongeBob Toyota Highlander branded premiums, airbrush tattoos and interactive areas where kids can create a fun SpongeBob GIF to share with friends online. The SpongeBob Toyota Highlander summer-long promotion will also be supported online with a dedicated website and promoted through digital display advertising and social media. Beyond the Toyota partnership, Nickelodeon will be celebrating all things Bikini Bottom this summer with a myriad of SpongeBob-themed activities taking place nationwide, capped by the first-ever SpongeBob Fan Shellabration at Universal Studios Hollywood, in Los Angeles, Calif., Sept. 7-8. This summer, Gallery Nucleus will curate and host a fan-created SpongeBob-themed art exhibition in Alhambra, Calif., July 27-Aug. 11. In August, Nickelodeon will announce the winners of the first-ever SpongeBob SquareShorts: Original Fan Tributes, a global competition that encouraged SpongeBob fans to create and submit short films, across all genres, featuring everyone's favorite porous pal. The winning short will be screened at the inaugural SpongeBob Fan Shellabration in September.